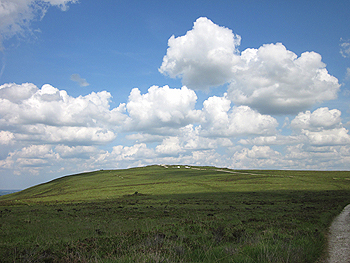 Menez Hom is the westernmost point of the chain called the Montagnes noires (Black Mountains), running across Finistere. Although only reaching 330m, this rounded peak gives the impression of lofty height, and its position, overlooking the Baie de Douarnenez and Rade de Brest, has created a place of legend. 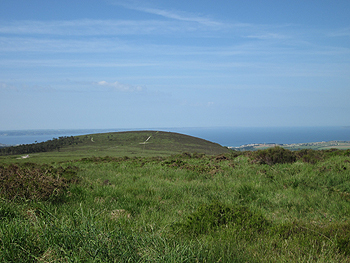 Legendary King Marc’h of the horse’s ears is said to have been buried here, and it is thought to have been a sacred Celtic site. In the early 20th century a helmeted statuette of the Roman goddess Minerva was found on the lower slopes. The addition of a swan motif has led to the suggestion that it is in fact the Celtic goddess Brigitte, in a typical assimilation of local deities into the Roman pantheon. 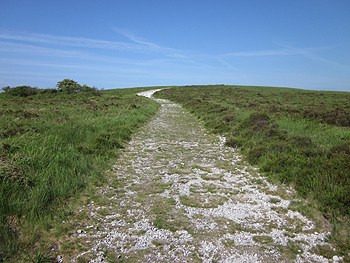 Afterwards, the path descends to the main road and then takes a wide loop through hamlets and open countryside to return to the starting point. Sights on the way include a sacred spring and a dolmen, Menez Lié, which demonstrates exactly why someone in the 18th century coined the term dolmen or ‘stone table’, to describe Neolithic burial sites. The circuit is marked from the start by yellow waymarks with a stretch on the summit following the GR (red and white waymarking). Full directions and photos for this walk (and many others) are given in Walking in Finistere, published by Red Dog Books. 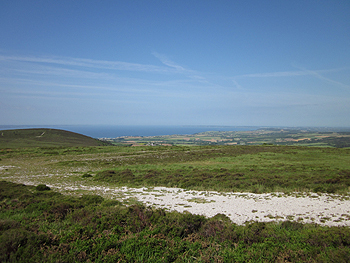 If you don’t fancy a four hour walk, there are plenty of paths for strolling about on the wide open spaces of Menez Hom and Petit Menez Hom, the lower rounded hill to the west of the main site, easily accessible from the parking. The latter is much less frequented and provides a great picnic spot. Over the brow the sea views are dazzling.